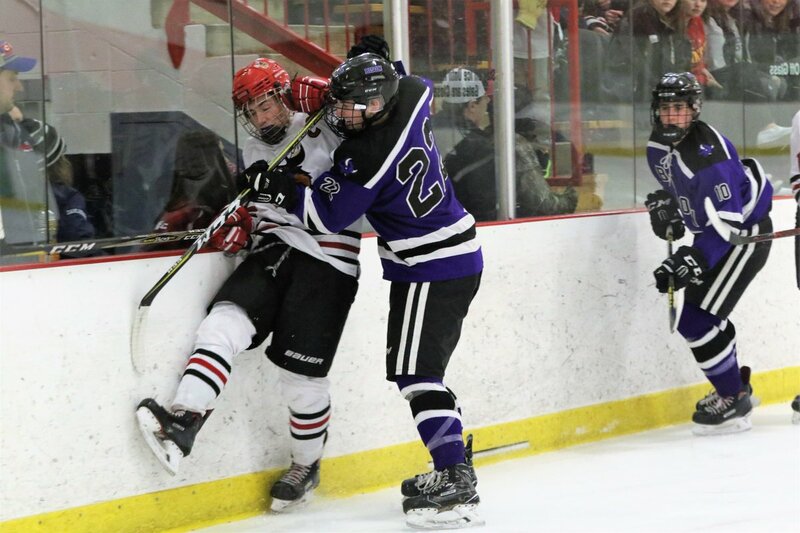 One flip of the calendar into the new year brought instant excitement for the Buffalo boys' hockey team. With three games, including two key rivalry matchups, over a six-day span, the Bison got instant results. The Bison opened 2018 with a 3-0 shutout last Thursday at Monticello. Two goals by Jake Braccini, one in the first period and the other in the third, led Buffalo's offensive attack. Braccini also assisted on Ben Klein's power-play goal midway through the second period. 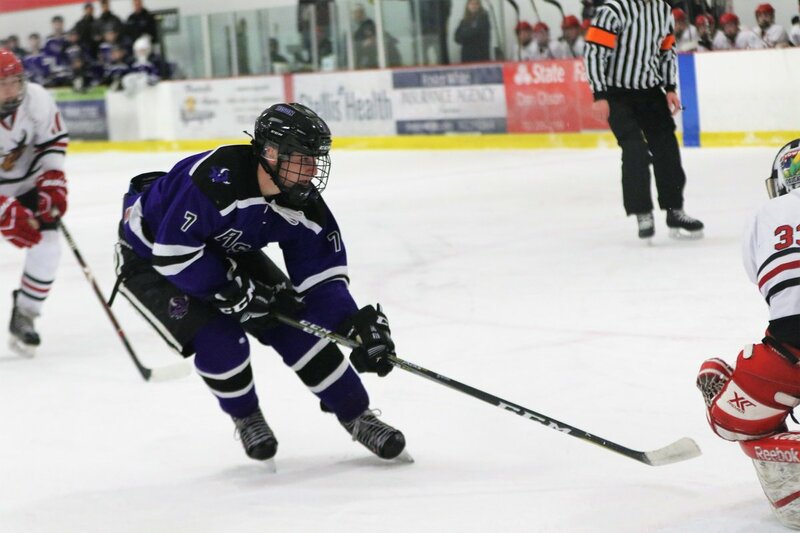 Joe McNamara added two assists, and Cal James and Ben Lindvall also earned helpers. Buffalo allowed only 18 shots, while firing 21 the other way. Nathan Mueller recorded his second consecutive shutout, and fourth of the season in goal. Mueller was in goal a year ago when Buffalo lost 3-2 to the Moose in the same building. He said that particular game gave him and his team the extra motivation to make amends. "Losing to them last year, and to come back and beat them felt good," said Mueller, who has nine career shutouts. "Tonight we played good defense with high structure. That led to our offense at times." Buffalo's offense of late has relied mostly on its top line of Klein, Braccini, and Tyler Braccini. Jake's two goals increased his season total to 12 and his three points added to his team-lead with 18. Devin Huebner was moved from Buffalo's third line to the top line for the third period of Thursday's win. A hit along the boards to Tyler Braccini during the second period knocked him out of game with concussion-like symptoms. Even without one of their top scorers, Buffalo put the clamps down in period three and held the Moose and their student section (Monti Ultras) without anything to cheer about for most the contest. 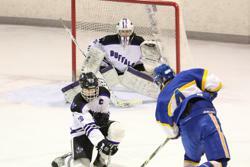 Monticello had two chances down 2-0 to close the gap, but Buffalo successfully killed two power plays. Jake Braccini's second goal came on a breakaway while shorthanded, and sent the near capacity crowd home early. "It's awesome, because coming in you know this place is going to be packed with a lot of energy," said Klein, on what it felt like to silence the Monti Ultras. "When you're able to get the first couple goals it really makes them quiet down and it gives you the energy to go play. We had the whole team put a whole 51 minutes together. When we play as a team, it really makes the game go a lot smoother." The Moose, currently ranked No. 13 in Class A, are one year removed from their fantastic season a year ago when they finished as state runner-up in Class A to Hermantown. The loss was only their second of the season. Factor in a rivalry matchup with a packed building and up-and-coming squad like the Bison, and Head Coach Aaron Johnson admitted even he felt goose bumps coming into the building. "You get excited for these rivalry games," Johnson said. "Even coming into the rink tonight, I had that nervous energy. I know the kids did too. It's fun when you play these communities that are neighbors. A lot of kids know each other, and it's a lot more fun when you come out on the winning side." Buffalo improved its win streak to three with a 2-1 road win last Saturday at Blake. The Bears led 1-0 after two periods, but Jake Braccini tied the score early in period three. Klein and Joe McNamara assisted on Braccini's 13th goal. Buffalo's second line produced the eventual winning score with Ryan Nelson's goal, assisted by Tyler Marr, came with 6:27 left in regulation. Buffalo defeated a Blake team that was unranked in Class AA, but has wins this season over No. 15 Wayzata and No. 8 (Class A) Breck. "That was a nice win for us," Johnson said. "They are a good program. We had a slow start, but our second and third period was really strong." 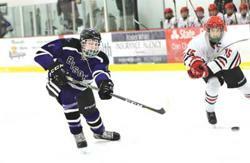 Arguably, the area's biggest rival took place Tuesday night when Buffalo hosted No. 17 St. Michael-Albertville. In front of a packed Buffalo Civic Center, Cody Kelly's deflected shot 2:56 into overtime game STMA a 4-3 road win. The Bison trailed 2-1 after one period, and 3-2 after two. Nate Persson's goal 26 seconds into the third period tied the score 3-3. Buffalo was outshot and outplayed for most the contest, but Mueller kept the Bison in the game with a number of key saves. The Knights outshot Buffalo 47-17 for the contest. "With Nathan in net, we always have a chance," Johnson said. "He's pretty special. He gives us a chance to win every night, and tonight was a great performance by him." STMA got goals by Adam Flammang, Zach Sjelin, Garrett Sandberg, and the OT winner by Kelly, whose shot deflected off the hip of a Bison defender, past a stunned Mueller. Persson, Cal James, and Nelson scored for the Bison. Nelson's goal proved to be a huge play in the game as STMA had just started a five-minute power play on a boarding major to Ben Lindvall. Prior to the major, STMA had built a 3-1 lead and was pinning the Bison in their own end shift-after-shift. "I thought we were playing very timid, and I felt if they got the next one, it was probably over right then," Johnson said. "I called the timeout to calm the guys down, and Ryan made a big-time play for us with the shorthanded goal. That was a big-time play from the hard work he puts in." 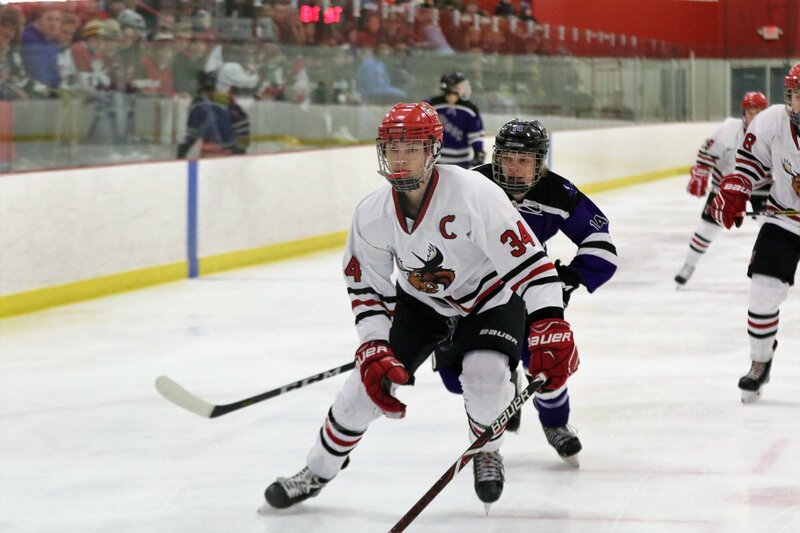 Still missing Tyler Braccini, and playing the last 10 minutes of period three without captain Joe McNamara, the Bison ran out of gas with guys playing heavy minutes against a deep STMA squad. "That's 12 seniors playing for STMA, and we have two," Johnson said. "The kids battled their butts off, but against a team that's big, strong, physical, mature -- they wore us down and you saw that at the end of the game." 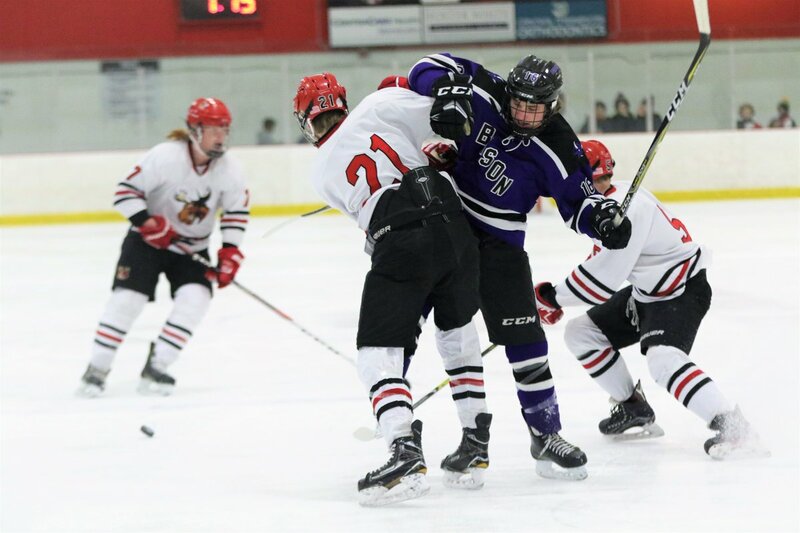 Buffalo (6-7 overall, 3-1 conference) host Bemidji on Saturday, Jan. 13 at 3 p.m.
First period: B -- Jake Braccini (Ben Lindvall, Joe McNamara) 10:46. Second period: B -- Ben Klein (J. Braccini, Cal James) 12:00, PP. Third period: B -- J. Braccini (McNamara) 15:49, SH. Goalies: B – Nathan Mueller (win) 18 shots, 18 saves; M – Tyler Klatt (loss) 21 shots, 18 saves. Shots: B – 8-9-4 – 21; M – 7-4-7 – 18. Power Plays: B – 1-1; M – 0-2. First period: BL -- Landon Peterson (Charlie Ankeny, Kyle Meredith) 15:39. Third period: B -- Jake Braccini (Joe McNamara, Ben Klein) 3:59; B -- Ryan Nelson (Tyler Marr) 10:33. Goalies: B – Nathan Mueller (win) 39 shots, 38 saves; BL – Aksel Reid (loss) 17 shots, 15 saves. Shots: B – 3-4-10 – 17; BL – 12-9-18 – 39. Power Plays: B – 0-0; BL – 0-0. First period: STMA -- Adam Flammang (Luc Laylin) 5:12; B -- Cal James (Jake Braccini) 10:02, PP; STMA -- Zach Sjelin (Val Popowski)14:23. Second period: STMA -- Garrett Sandberg (unassisted) 3:18; B -- Ryan Nelson (unassisted) 9:08, SH. Third period: B -- Nate Persson (Joe McNamara) 0:26. Overtime: STMA -- Cody Kelly (Caden Sigerud) 2:56. Goalies: STMA – Justin Damon (win) 17 shots, 14 saves; B – Nathan Mueller (loss) 47 shots, 43 saves. Shots: STMA – 16-19-9-3 – 47; B – 4-8-5-0 – 17. Power Plays: STMA – 0-2; B – 1-3.